Bang & Olufsen speakers on a handset? Oh yes. Review Some phones get all the luck. Some get to be called Soul, or Tocco - we found out it's Italian for 'touch' - or even Omnia. But others get lumbered with a less emotive moniker. Like F400. 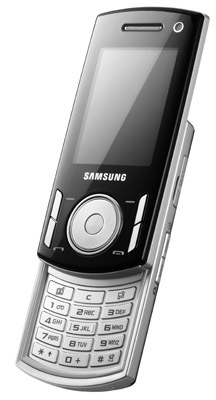 The Samsung handset is fairly standard to look at, with silvered sides and a glossy black front. At 17mm thick, it's chunky, but then it feels a little lighter than it looks - it's 108g. Despite this, it doesn't feel cheap – it's a respectably-built mid-range device. On the side is a Micro SDHC memory card slot which will allow you to boost the meagre 20MB of on-board memory by up to 8GB. Next to it, you'll find volume buttons, a power/headphone socket, and dedicated buttons for both music player and camera. The phone slides open easily - perhaps a little too easily if you plan on keeping it in a jeans pocket - and opens with a nice, cushioned thunk. The keypad revealed is a good size with well-defined, responsive buttons – nothing too clever or fancy; perfect for texting really. The averaged-sized 2.2in, 262,000-colour screen is clear, bright and offers excellent definition, though it's not the easiest to read in bright sunlight thanks to its glossy covering.